An Australian at the cutting edge of global trends affecting societies, businesses and individual citizens is the recently retired Director General of Australia Security Intelligence Organisation (ASIO), David Irvine. In addition, David was also head of Australian Secret Intelligence Service (ASIS). Fundamental to good leadership and effective business resilience is an understanding of the environment in which the business, its clients, its competitors and its staff must operate. David Irvine delivers his perspective on the business imperative for surviving and thriving in today’s World. He provides a compelling narrative that everybody should hear. Cyber security is a real threat and David Irvine is in a rare position to counsel Australian companies on the both the dangers faced today and the solutions. ​David Irvine is unique in the history of Australian intelligence, a long-serving diplomat who is the only person to have served as the head both of Australia’s foreign intelligence collection agency and its domestic security agency – positions he held for a total of twelve years. His extensive experience in the management of national intelligence agencies in a liberal democratic political system and under the Rule of Law gives him a special perspective on national security issues, including the countering of terrorism, espionage and other covert threats to national security. David Irvine is a Leader who has had to manage complex government organizations covering a wide range of disciplines and skill sets. He has worked extensively with businesses on cyber security issues and with community and other groups focused on the governance of national security agencies and the relationship between national security and civil liberties. David has served in Rome, Jakarta, Beijing, Hong Kong and Port Moresby. He was High Commissioner in PNG and Australia’s Ambassador to China, Mongolia and North Korea. ​With his extensive diplomatic background, he has a wealth of experience working on Asian affairs and Australia’s relationships in this the fastest growing economic region in the world. ​David Irvine has a bachelor degree with honours in Arts from the University of Western Australia. He has an honorary Doctorate of Letters from that university and an honorary Doctorate of Science from Edith Cowan University. ​He is currently a Visiting Fellow of the National Security College within the Australian National University, and at the Australian Strategic Policy Institute, and Chairman of the Board of the Australian Cyber Security Research Institute. 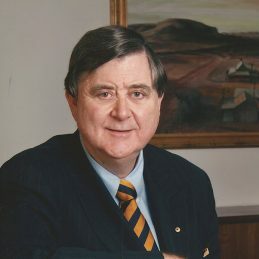 ​David Irvine was made an Officer of the Order of Australia (AO), in 2005 for services to the promotion of Australia’s international relations.